Well, if that's not a big enough clue to what my daughter will be dressing as for Halloween, I don't know what is! Yep, she's going to be Minnie Mouse. 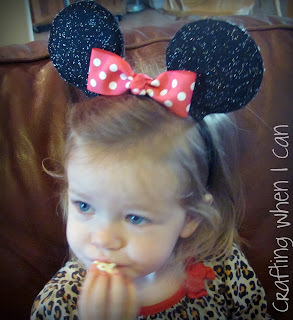 Mickey Mouse Clubhouse has been her favorite show for months, so Minnie was a no-brainer for me. 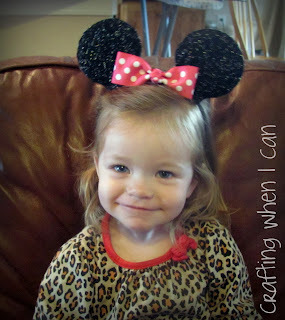 Her birthday theme (in December) will be Mickey Mouse Clubhouse, so she may be wearing the costume then, too. I just finished the dress, so I'll hopefully be sharing that soon, but I don't have pics of Annelise in it yet. The mouse ears were pretty easy to make. They took about an hour and about $4.00 (all supplies from Hobby Lobby, of course!). I mostly followed the tutorial on The Suburban Mom, and got a free ears template on the Disney Junior website (they have a lot of fun crafts & recipes, too). As soon as Annelise got up from her nap and saw the ears, she wanted to put them on. Hopefully she won't destroy them before Oct 31. I'm also planning to make a few more sets for the kids at her birthday party, but I think they will all be out of plain black felt. The birthday girl should be the only one with the sparkly pair, right?